Mr Bear and Barbie are shacked up in the lobster's wardrobe just at the moment. Here they are having a bath together. They seem to be quite content, so I'll just leave them to it. The compost heap on the left of this photo is due for demolition. The whole area is due to be re-developed during the spring. Isn't it a shame when this happens? Lobster Blogster says: "No comment!" 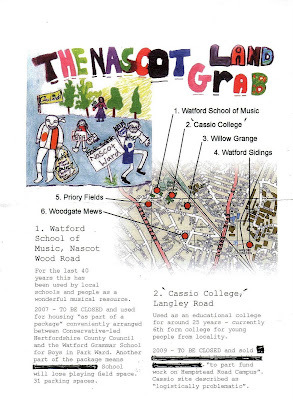 Lobster Blogster has been asked by Sally Ivins to post some campaign material which relates to developers greedily grabbing gardens and other open space for profit, in her locality, which is the Nascot ward of central Watford. Click on either image to enlarge and read, or to print off your own copies. 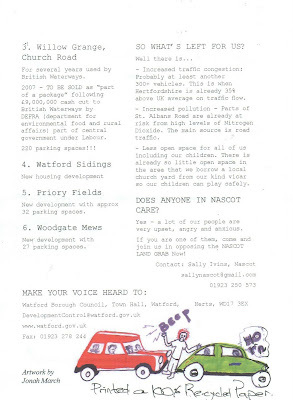 The two images could be printed back to back to make an A5 leaflet, or side-by-side as one side of an A4 sheet.